We are super proud of this photo – MNC Directors and Managers onstage as Winners in the Small Business Catergory at last years Awards Night. In November this year MNC will be working in Partnership with the Business Women Excellence Awards and will be the sponsors of the Mentor and Coach Category. Last year we were the very proud winners of the Small Business Catergory and now its our turn to support the entrepreneurial community that we know and love. The awards are a great opportunity for you to raise the profile of your business and fine tune your submission entry skills. 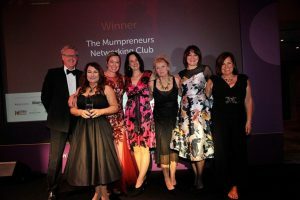 The Awards evening itself is a chance to hang out with MNC HQ, throughout the year we work hard to provide profile raising opportunites at meeting, events and online to amplify the hardwork that you are already putting into the business. By joining the MNC team you will be able to surrounding yourself with successful business woman, embrace our culture of success and be inspired by all the winning woman on the stage. We will be asking Managers, Brand Ambassadors and MNC members to book tickets and share the spotlight with us on the night, drink champagne, dress up and have a boogie on the dance floor! If you are interested in being part of the MNC team on Friday 30th November add a comment in the blog post (we are just about to confirm the ticket prices) and then we can contact you directly. You can read about the Awards here, we have attended the last few years and know just how hard Faiza and her team work to pull off the event. Below is what we will be covering at the workshop. Why Should You Enter Awards? How do you leverage your involvement with the awards and the event?